The Galápagos is a wildlife shooter’s dream location. The animals, including birds and lizards, are so unafraid of people that the photography experience is unprecedented. Based on my experience, I could have shot nearly everything with my 70-200mm + teleconverter combo, or used something like a 70-300mm or 80-400mm. The additional reach and optical quality of my 500mm lens was great, but by no means was it a lens I felt I “needed.” In fact, since there was a fair bit of shooting from the pangas, the best bet was to use a modest telephoto zoom with image stabilization that is easily hand-held. In fact, there were times when I was shooting wildlife up-close from the panga where I would have been too close to use the 500mm lens. All my “serious” photographs in the Galápagos were of wildlife. The shorter lens is small and light enough to use as needed, but my iPhone camera was perfect for casual daytime landscapes. Since most tours won’t have you on shore for sunrises or sunsets (times are set by the park service), I don’t view the Galápagos as a landscape destination. Moreover, the logistics of panga landings make carrying tripods awkward. Because most, if not all, Galápagos excursions involve some sort of boat transportation, keeping your gear safe and dry is a must. The other consideration is bag size, since you either need to wear a backpack over a life jacket (PFD) or put it between your feet on the panga floor, which can be wet. For this trip, I had the opportunity to test the LowePro DryZone 200 photo backpack, courtesy of site sponsor B&H Photo. This pack has a unique “dry pod” shell made of a rubberized fabric and a waterproof zipper. In this respect, it’s perfect if you truly want a waterproof bag. However, the DryZone was extremely awkward to work from, as its multi-layered design makes gear access difficult. It’s also extremely padded (overly so) and got a bit cumbersome on board the panga and our yacht. The LowePro Dry Zone 200 is the only truly waterproof camera bag on the market. In hindsight, I’d recommend using a small camera backpack that’s easy to work out of, and use either small dry bags (or even ziplock bags) to put your camera and lenses in while in transit. 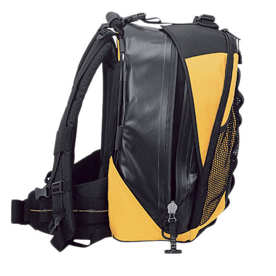 Most bags offer some form of closed-cell foam construction, which will protect your gear from a rogue splash. Smaller bags are easier to work out of and will be cooler to wear in the equatorial heat of the Galápagos. I’d recommend one of the Backlight series backpacks from MindShift gear to bring to the Galápagos. You can work from these bags without having to take them off, which helps to minimize your chances of getting sand in them. While some of my clients brought their complete laptop setups with them on our tour, I chose to use an Apple iPad Pro 12.9” (3rd generation). I was able to download photos from my D850’s SD card using a USB card reader with USB-C adapter. I then transferred my images to Adobe Lightroom CC (mobile), where I was able to triage and select keepers for editing. When I got home, I uploaded all the images (4200 of them!) to the Adobe Cloud server and then synchronized them to my desktop iMac on an external RAID drive. The elegance of this workflow was that while in the field, I only had to carry a 1-lb iPad and it’s charging cable, instead of my 5-lb laptop, charging brick, and external drive(s). The iPad Pro’s excellent battery life meant that I could work nearly anywhere on the boat without the need for plugging into a power source. When I returned home, I was able to synchronize all my images with Lightroom Classic CC (desktop) and all my pick flags and image adjustments were preserved. I retained the images on my D850’s XQD card as backup until I got back home. It’s been a couple of weeks since I returned home from my trip, and I am still in awe of the experience that is the Galápagos. It is someplace that every wildlife photographer should add to their bucket list.